Repairing crawl space damage and sealing it will promote energy efficiency and comfort in your home. When your crawl space is damaged, then the rest of your home suffers. 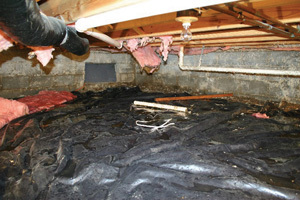 Crawl space rot, mold, or structural issues can extend to every part of your home. That is why we at Halco Basement Systems specialize in crawl space repair, being able to expertly diagnose and repair your below-grade space with ease. Call 1-844-385-7430 or click below to schedule a no-cost, no-obligation crawl space repair quote in New York, including Greece, Irondequoit, Pittsford, Pittsford and nearby today! Halco Basement Systems is your go-to contractor for crawl space repair. Whatever your home is experiencing, we have the superior products and skills needed to implement durable and long-lasting solutions. Restoring and sealing your crawl space will help minimize unneeded repairs, create a healthier home environment, and will ultimately help you save money on your energy bills. 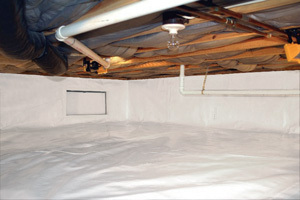 With crawl space encapsulation services using our superior vapor barrier system, you will have also gained secure and valuable home storage space! This crawl space has issues with moisture, mold growth, and failing insulation as a result of poor air sealing. Our crawl space encapsulation completely separates and protects your interior from outdoor conditions, keeping the space clean and dry. All-size solutions. 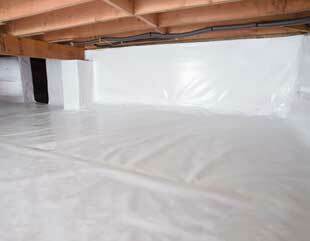 The Crawl Space Encapsulation System from CleanSpace® ensures your below-grade space is protected from moisture. 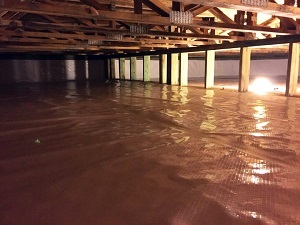 Our encapsulation system can also be adapted for all types of crawl spaces, big or small! As a Basement Systems® dealer, Halco Basement Systems only offers the best products from an international network of waterproofing contractors that have been doing business since 1987. Their in-house Research and Development department is always searching for the most innovative crawl space solutions, putting forth their most durable and lasting products.